What is Wrong with the Elevator – haunted?? I saved the strangest till last in my story of the Broadview Hotel in Wichita. As mentioned in previous posts, the Hotel is supposedly haunted. Though the topic of hauntings intests me, I am by no means a believer. I would like to find evidence of paranormal activity, but aside from the “haunted tree” in Burlington, there has been nothing that I have come across that leaves me convinced – and even the haunted tree was not really a conclusive experience – but it was certainly wierd. 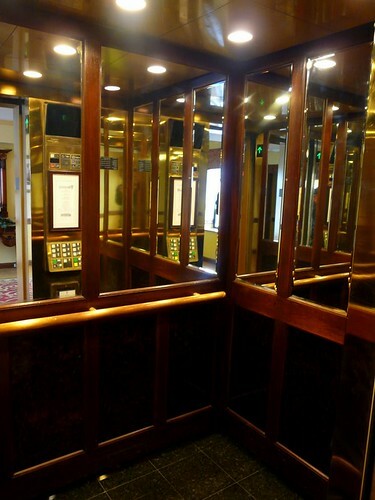 Anyway, I had been returning to my room after a few drinks down in the bar and in riding one of the old brass and mirror elevators up to the third floor, I was plagued by a jerky ride and flickering light – that left me wondering whether I was about to become stuck. Looking into the mirrors all round was quite dis-orientating and for a brief second, I was left with the impression that there may have been some kind of filmy human form that appeared down one of the endless panels of reflected glass. It wasn’t really spooky, just a little unusual and as I said – I was coming back from the bar downstairs and had already beeen primed by stories of the supernatural. Anyway, I looked around to see what might be standing next to me, thinking that the reflected image was someone else in the elevator, but there was nothing there.